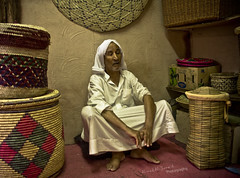 While we were driving in Bahrain ( Actually we lost the way =p ) .. we found a very small shop hiding between buildings .. it was for ( handmade baskets ) .. Luckily this time my camera was in the car .. so I stopped there to have a close look .. Unfortunately it was closed .. I asked the neighbors and they said an old man owns this shop and everyday he comes over in the afternoon .. I really wanted to meet this guy coz the stuff he makes are very interesting ..
when I came back .. I found the shop open .. and &quot;Alhaj Ali&quot; was there .. I was surprised ! he was blind .. and still makes baskets perfectly ! I had a little chat with him .. he started in 1989 .. I bought some stuff and asked him If I can take some shots and he didn’t mind at all ..